The latest thing that I’m really excited about is learning more about website design! I signed up for the very first month of courses offered by Ro Little of Mommy Blog Designs! The courses include Photoshop, HTML/CSS, and WordPress, and I have learned a lot so far! (She also offers courses on Blogger and other topics). I have been experiencing some frustration, though, because one of our computers refuses to download the trial version of Adobe Photoshop (or any comparable free photo editing software) and the other does not have enough free space for me to do anything productive! I have spent all week trying to fix our desktop but it looks like we are close to having to wipe the whole thing clean and start over if I ever want to be able to download anything from the internet ever again! Anyway, my husband bought another hard drive and removed tons of files from the laptop, so now I can get back to some hands-on learning… hopefully! Another thing that I’m excited about is the fall wreath that I made (and hung on the door with an hour left to spare on the first day of autumn)! 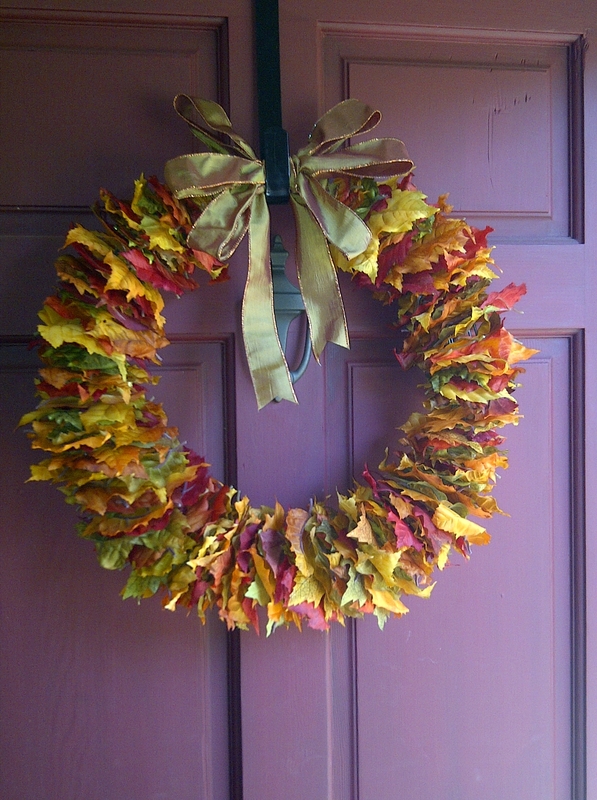 I ran across instructions for this DIY fall wreath on Blissfully Domestic. It was pretty simple to make, but did seem to take a lot of leaves. I think I used about 8 stems worth of leaves for an 18-inch wire wreath. Good thing they were half off at Michaels! The biggest news for Catholics this week is the start of the Year of Faith. I know a lot of bloggers have been spreading the word about this newsletter from Flocknote, but if you haven’t done so yet, be sure to sign-up to get daily emails so you can Read the Catechism in a Year! It’s encouraging to know that so many others are reading the same thing at the same time! I heard about a great prayer from somebody on Twitter this week and thought I’d share it here on A Dreamer’s Wife. Check out Praying for My Husband from Head to Toe available from Renee Swope. COMING SOON! One of the regular 7 Quick Takes participants will be featured in my Dreamer in the Spotlight series for October! Be sure to check back on the last Friday of the month to see who! As usual, please check out Jen’s and other 7 Quick Takes posts at Conversion Diary! I loved learning web design and I find it super beneficial when blogging! Now it’s one of my favorite hobbies 🙂 I also really like your wreath! Yeah, I’m excited about it if I can get one of my computers to cooperate! Thanks – love simple craft projects that I can actually do! Oh I would love that class! I’ve done a lot of my own research when it comes to designing on blogger but I can’t figure out how to navigate the most simple things on WordPress for the life of me. Will have to check it out! Love that wreath! And thank you for sharing that prayer, I was just looking for a good one for a friend preparing for marriage…and me, too of course. it’s like you read my mind! You should definitely check the Mommy Blog Design courses out. She’s opening up registration for November courses on the 15th of this month! Glad you liked the prayer. I’m glad I found it too! I LOVE that wreath! I signed up for the Catechism emails weeks ago and haven’t gotten one yet; I keep checking my inbox. That’s too bad! Maybe you should try to sign up again. The second one was sent today first thing in the morning. Thanks – if the wreath wasn’t so simple, I wouldn’t have one hanging on my door right now! !